The first time I saw North End Road market, I didn’t get it. It didn’t look like much. Lots of ragtag stalls selling very ripe fruit and veg, batteries, fish, candy and suitcases, that kind of thing. But now, I head for North End almost every day and for me, it’s a quintessential London experience – vibrant, incredibly cheap, rough around the edges and lots of fun. It’s the only place where I am still regularly called young lady, or darling, or ‘luv’. Open six days a week, but best on Fridays and Saturdays, the market runs between Lillie and Walham Grove roads on London’s North End Road in Fulham. One of the reasons I love North End Road market is its local history. Since 1887, residents of Fulham and passers by alike have come to the market in search of a bargain. Many stalls have been run by the same families for generations. 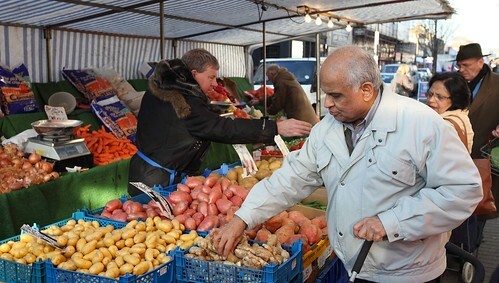 The clamour of traders calling out their products and prices, the polyglot of languages and the rush of traffic make North End a bustling, multi-cultural place where ethnic foods sits next to English cauliflowers and purple sprouting broccoli to satisfy an increasingly diverse group of shoppers. Preserved lemons from Egypt, Camembert cheese from France, milk fish from the Philippines and plantains from the Caribbean are all part of the North End offering. As well as the diversity of products, people come to North End from across London for the amazing prices. A dozen lemons or a bowl of avocados for a pound is common. Sometimes, whole boxes of tomatoes or oranges are sold for that price. The market provides a real benefit to anyone trying to stretch a budget or follow their doctor’s advice to eat more fruit and veg. Avid cooks and foodies go for the fresh and exotic ingredients, restaurants go for a quick resupply and children head there for the discounted sweets while their mothers search for inexpensive shoes. In effect, North End becomes a community meeting point for Fulham's old and young, well off and the struggling, long times resident and the recently arrived. For visitors to London, North End is an “off the beaten track” opportunity to see an authentic London market without tourists. It is not very big and definitely not picturesque like Portobello or upmarket like Borough but its where ‘real’ Londoners, in anoraks, burkhas, track suits and school uniforms all come to argue, joke, discuss the state of the world and bag some of the best food bargains in town. Thank you for this post. I have lived locally for 6.5 years & quite simply, I love North End Road Market. Without it, I doubt I would have stayed this long in London - Saturdays here are just too pleasurable to give up. I think you've really captured what the market is all about. Thanks again & perhaps see you in the queue! And thank you for this wonderful comment. Its great to hear from a fellow North End enthusiast and yes, see you in the queue. This market is the cat's whiskers! I have a perfectly ok one near me in Tooting and one on my doorstep at Wimbledon Dog Track but they lack something and I will happily do a half hour cycle or a combination of 44 and 28 buses to get my fix of fruit and veg and unique street action. I'm not sure if its the unpredictability, the mix of characters, the chaotic claustrophobia of it all... but it really is hard to beat! Great to hear from more fans of North End, especially one who travels all the way from Wimbledon and yes, North End is hard to beat. Just back from North End Rd with my bag of bargains & find your great blog as well! I'd love to hear what you bought today - what looked good? - what were the best bargains? Memories from the time when the shops up North End road had no fronts, business was performed straight out onto the street. As a nipper just after the war in 1946, this then eight year old would stand on the Lillie Road corner, and call out to the old ladies carrying their shopping, carry yer bag for a tanner Misses. It was a way for us to collect a few coins picture money? Dr Whackem, my step-dad, was a well known florist up the market then, he would raffle any flowers he had over on the Sunday, in the local pub. I wonder if the Crown still exists. I moved on in the 50s and now live in Holland, the land of the tulips and windmills.